This specification is an update to [ PointerEvents ] which was shipped broadly only by Microsoft Internet Explorer and Microsoft Edge (though a further independent and mostly interoperable implementation was present in a pre-release build of Mozilla Firefox when the Pointer Events specification was published as a W3C Recommendation). Level 2 includes editorial clarifications, new features and minor breaking changes that address certain limitations and concerns that have been raised about aspects of the design, in an effort to enable wider browser adoption. This document was published by the Pointer Events Working Group as a Candidate Recommendation. This document is intended to become a W3C Recommendation. Comments regarding this document are welcome. Please send them to public-pointer-events@w3.org (subscribe, archives). W3C publishes a Candidate Recommendation to indicate that the document is believed to be stable and to encourage implementation by the developer community. This Candidate Recommendation is expected to advance to Proposed Recommendation no earlier than 07 June 2018. Today, most [ HTML5 ] content is used with and/or designed for mouse input. Those that handle input in a custom manner typically code to [ DOM-LEVEL-3-EVENTS ] Mouse Events. Newer computing devices today, however, incorporate other forms of input, including touchscreens, pen input, etc. Event types have been proposed for handling each of these forms of input individually. However, that approach often incurs unnecessary duplication of logic and event handling overhead when adding support for a new input type. This often creates a compatibility problem when content is written with only one device type in mind. Additionally, for compatibility with existing mouse-based content, most user agents fire Mouse Events for all input types. This makes it ambiguous whether a Mouse Event represents an actual mouse device or is being produced from another input type for compatibility, which makes it hard to code to both device types simultaneously. The pointerId selection algorithm is implementation specific. Therefore authors cannot assume values convey any particular meaning other than an identifier for the pointer that is unique from all other active pointers. As an example, values are not guaranteed to be monotonically increasing. The normalized pressure of the pointer input in the range of [0,1], where 0 and 1 represent the minimum and maximum pressure the hardware is capable of detecting, respectively. For hardware that does not support pressure, the value MUST be 0.5 when in the active buttons state and 0 otherwise. Note: all pointerup events will have pressure 0. The normalized tangential pressure (also known as barrel pressure), typically set by an additional control (e.g. a finger wheel on an airbrush stylus), of the pointer input in the range of [-1,1], where 0 is the neutral position of the control. Note that some hardware may only support positive values in the range of [0,1]. For hardware that does not support tangential pressure, the value MUST be 0. The plane angle (in degrees, in the range of [-90,90]) between the X-Z plane and the plane containing both the transducer (e.g. 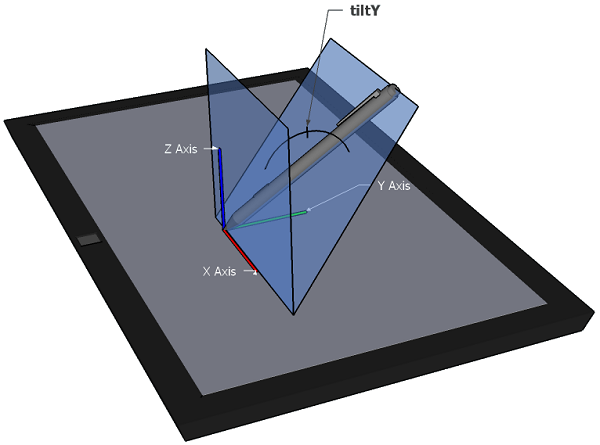 pen stylus) axis and the X axis. A positive tiltY is towards the user. 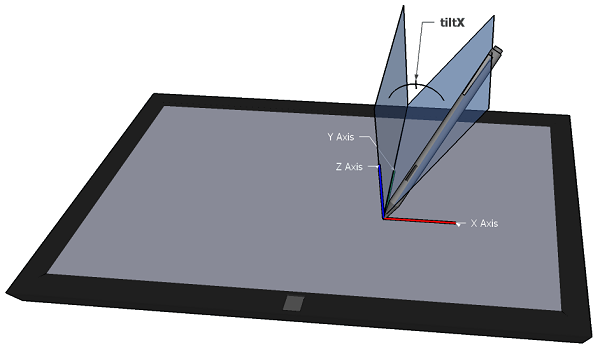 tiltY can be used along with tiltX to represent the tilt away from the normal of a transducer with the digitizer. For devices that do not report tilt, the value MUST be 0. The clockwise rotation (in degrees, in the range of [0,359]) of a transducer (e.g. pen stylus) around its own major axis. For devices that do not report twist, the value MUST be 0. The PointerEventInit dictionary is used by the PointerEvent interface's constructor to provide a mechanism by which to construct untrusted (synthetic) pointer events. It inherits from the MouseEventInit dictionary defined in [ DOM-LEVEL-3-EVENTS ]. The steps for constructing an event are defined in [ DOM4 ]. See the examples for sample code demonstrating how to fire an untrusted pointer event. The PointerEvent interface inherits from MouseEvent, defined in [ DOM-LEVEL-3-EVENTS ] and extended by [ CSSOM-VIEW ]. Instead, chorded button presses can be detected by inspecting changes to the button and buttons properties. The button and buttons properties are inherited from the [ DOM-LEVEL-3-EVENTS ] MouseEvent interface, but with a change in semantics and values, as outlined in the following sections. The modifications to the button and buttons properties apply only to pointer events. For any compatibility mouse events the value of button and buttons should follow [ DOM-LEVEL-3-EVENTS ]. Using the pointer capture target override as the target instead of the normal hit-test result may fire some boundary events. This is the same as the pointer leaving its previous target and entering this new capturing target and if they are different targets boundary events should be dispatched first. When the capture is released the same scenario may happen as the pointer is leaving the capturing target and entering the hit-test target. For all pointer events in the table above, composed ([ WHATWG-DOM ]) attribute SHOULD be true and detail [ DOM-LEVEL-3-EVENTS ] attribute SHOULD be 0. Similar to the MouseEvents [ DOM-LEVEL-3-EVENTS ] the relatedTarget should be initialized to the element whose bounds the pointer just left (in the case of a pointerover or pointerenter event) or the element whose bounds the pointer is entering (in the case of a pointerout or pointerleave). For other pointer events, this value will default to null. Note that when an element receives the pointer capture all the following events for that pointer are considered to be inside the boundary of the capturing element. Sets pointer capture for the pointer identified by the argument pointerId to the element on which this method is invoked. For subsequent events of the pointer, the capturing target will substitute the normal hit testing result as if the pointer is always over the capturing target, and they MUST always be targeted at this element until capture is released. The pointer MUST be in its active buttons state for this method to be effective, otherwise it fails silently. Throws a DOMException with the name InvalidPointerId when the provided method's argument does not match any of the active pointers. Releases pointer capture for the pointer identified by the argument pointerId from the element on which this method is invoked. Subsequent events for the pointer follow normal hit testing mechanisms (out of scope for this specification) for determining the event target. Throws a DOMException with the name InvalidPointerId when the provided the method's argument does not match any of the active pointers. The following section describes extensions to the existing GlobalEventHandlers interface, defined in [ HTML5 ], to facilitate the event handler registration. In the case of pan-left, pan-right, pan-up and pan-down, the direction is interpreted as the opposite of the physical movement in the local coordinate space. For example, pan-up corresponds to input event sequences where typically screenY is increasing (i.e. an interaction where the user moves a touch point down the screen) when the element has no effective CSS transforms. If the element is effectively rotated by 90 degrees counter-clockwise, pan-up would then correspond to input event sequences where screenX is increasing. The direction-specific pan values can also be used for composing a component that implements custom panning with pointer event handling within an element that scrolls natively (or vice-versa). For example, an image carousel may use pan-y to ensure it receives pointer events for any horizontal pan operations without interfering with vertical scrolling of the document. When the carousel reaches its right-most extent, it may change its touch-action to pan-y pan-right so that a subsequent pan operation beyond its extent can scroll the document within the viewport if possible. It's not possible to change the behavior of a pan in the middle of an operation. If the Element on which this method is invoked does not participate in its ownerDocument's tree, throw an exception with the name InvalidStateError. If this method is invoked while the page has a locked element ([ PointerLock ]), throw an exception with the name InvalidStateError. If the pointerId provided as the method's argument does not match any of the active pointers and these steps are not being invoked as a result of the implicit release of pointer capture, then throw a DOMException with the name InvalidPointerId. This is a breaking change from [ PointerEvents ], but does not impact the vast majority of existing content. In addition to matching typical platform UX conventions, this design for implicit capture enables user agents to make a performance optimization which prevents the need to invoke hit-testing on touch movement events without explicit developer opt-in (consistent with the performance properties of existing dominant native and web APIs for touch input). Immediately after firing the pointerup or pointercancel events, a user agent MUST clear the pending pointer capture target override for the pointerId of the pointerup or pointercancel event that was just dispatched, and then run Process Pending Pointer Capture steps to fire lostpointercapture if necessary. If the user agent supports firing the click event (see compatibility mouse events) and if in an implicit release scenario both click and lostpointercapture events are fired, click should be fired before lostpointercapture. When the pointer capture target override is removed from its ownerDocument's tree, clear the pending pointer capture target override and pointer capture target override nodes and fire a PointerEvent named lostpointercapture corresponding to the captured pointer at the document. The click event, defined in [ DOM-LEVEL-3-EVENTS ], and the contextmenu event, defined in [ HTML5 ], are not considered compatibility mouse events as they are typically tied to user interface activation and are fired from other input devices, like keyboards. While only the primary pointers can produce compatibility mouse events, multiple primary pointers can be active simultaneously, each producing its own compatibility mouse events. Since all these compatibility events would appear to MouseEvent code to be coming from a single mouse device, user agents are encouraged to guarantee that the compatibility mouse events are consistent from a single device perspective. For mouse transition events (i.e., mouseover, mouseout, mouseenter and mouseleave), this means the entry/exit state for every event target is valid as implied by [ DOM-LEVEL-3-EVENTS ]. Users agents SHOULD guarantee this by maintaining the effective position of the legacy mouse pointer in the document as follows. If T and current effective legacy mouse pointer position are both unset or they are uqual, terminate these steps. 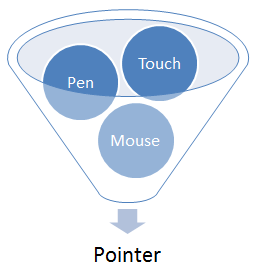 Dispatch mouseover, mouseout, mouseenter and mouseleave events as per [ DOM-LEVEL-3-EVENTS ] for a mouse moving from the current effective legacy mouse pointer position to T. Consider an unset value of either current effective legacy mouse pointer position or T as an out-of-window mouse position. The following is an informative summary of substantial and major editorial changes between publications of this specification, relative to the first [ PointerEvents ] specification. See the complete revision history of the Editor's Drafts of this specification. Add direction-specific touch-action values (pan-left, pan-right, pan-up, pan-down) and clarified behavior of existing pan-x and pan-y values.